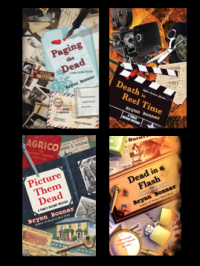 I finally got around to writing a series of questions (download below) that I hope will prompt discussion for the first book in my Family History Mystery series, PAGING THE DEAD. To mark this accomplishment I’m going to give away a book club package-six copies of the book along with the guides. If your book club is looking for the next book please enter to win. Leave a comment below for one chance, follow this site for another chance, and hop on over to FB for a third chance. I’ll pick a winner at random on June 25. Also, if you know a group of people who might be interesting in FORMING a book club with you (especially if they’re family history buffs already), this would be a good opportunity for you to get that going. Summer’s a great time for reading and for getting together with friends!